It all starts with a text: “Call me ASAP – 187”. Mickey Haller knows only too well that this is the California Penal Code for murder, and that this could be a big money, high-stakes case for him. What he doesn’t know at this point is that not only does he know the victim, but he may also bear some responsibility for her death. Now he realises one thing – he is the only man who can bring her real killer to justice. Will the guilt he feels from his past win the day, or might Haller yet be able to redeem himself? The Gods of Guilt is a gripping, fast-paced courtroom drama, and comes fifth in the series featuring the wise-cracking defence attorney Mickey Haller (who made his debut in The Lincoln Lawyer (2005)). The novel’s title comes from how he refers to the trial jury. Michael Connelly cut his teeth reporting crime for the Los Angeles Times before deciding to create crimes of his own. He’s now the author of several standalone thrillers and the phenomenally successful series featuring Haller’s older half-brother, the LAPD detective Harry Bosch. He’s won a host of international awards and his work can now be found in more than 30 languages. Ian Rankin, the Edinburgh-based creator of the Inspector Rebus series, cites Connelly’s chiller The Poet (1996) as one of his favorite ever crime novels. 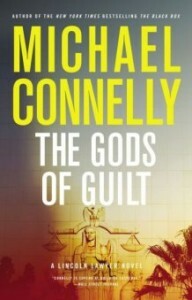 The five-star reviews have been flooding in for The Gods of Guilt and I know Connelly fans who are saying that this is the best Mickey Haller so far. Some are saying it deserves a place right up alongside classic courtroom novels such as To Kill a Mockingbird. Now that’s high praise indeed.